For some, few players more thoroughly encapsulated everything “wrong” with the women’s game better than Michelle Larcher de Brito. The Portuguese powerhouse arrived on the WTA Tour in 2008 with her heart on her sleeve, an amplifier in her pocket, and a polarizing personality that immediately divided the tennis community. A talented ball-striker, Larcher de Brito quickly went from starlet to side show after a series of big (but mostly small) stage meltdowns shook her confidence and damaged her credibility. Many may remember her major breakthrough on the clay courts of Paris, but her bigger successes have since come on grass — her two Top 10 scalps have both come in Britain’s backyard. In light of Wednesday’s win over Ana Ivanovic, David and Victoria convene to discuss the lady, the myth, the legend that is Michelle Larcher de Brito. David Kane: When you hear Larcher de Brito’s name, what do you think about? If you’re me, you remember seeking out the then-15-year-old play a first round match at the 2008 US Open qualifying tournament. I had seen much of her thrilling three-setter against Svetlana Kuznetsova, a match that was the first time the teenager had been seen (and heard) by the tennis world at large. The technique off the ground was textbook, and I was excited to see that talent in person. It quickly became clear that there is more to Michelle Larcher de Brito that meets the eye (and ear). Victoria Chiesa: My earliest memory of Larcher de Brito also dates back to 2008, but predates her Flushing debut. VC: Indeed. I was 14 and had just discovered tennis streaming. Coincidentally, it was also my first run-in with the janky Bank of the West Classic security camera stream. Miss you, Hilary Barte! Many — okay, all — of my subsequent memories of her involve US Open qualifying, some combination of Courts 9, 10 and 11, Zarina Diyas, and tears. And you falling up the bleachers. DK: I’ve been called “uncoordinated” by umpire Louise Engzell’s face. By contrast, the Larcher de Brito Qualifying Show has all the choreography, soliloquies, and tragedy of Purcell’s Dido and Aeneas. For several years, the US Open couldn’t begin without Larcher de Brito dropping her racquet to sob into both hands at least five times per third set. All of the intensity and purity of shot was still there, but ultimately obscured by a dark cloud that has followed her arguably since the 2009 French Open. But what stuck with me most what the fact that Larcher de Brito just didn’t seem to care all that much. Kids these days! There have been some moments, however, when that talent has reemerged. Given her on-court issues, how is it that Larcher de Brito’s biggest moments have come on a surface that requires an almost reckless amount of decisiveness? VC: Larcher de Brito’s struggles seem out of place for someone who was so self-assured — so much so as to compare herself to Martina Hingis — at such a young age. I’m not sure where it all went wrong to this point, but it certainly could be a combination of on-court and off-court factors. In my view, Larcher de Brito’s wunderkind hype was straight out of a different era. Was it realistic to expect her to be a consistent factor on the WTA Tour at 15 and 16? It certainly hurt her much more than it helped her. In watching her over the years, I’ve always gotten the impression that she has the mentality of an aggressive baseliner, but simply doesn’t have the physical gifts to facilitate that style of play. She’s not all that tall, and saying her serve is prone to breaking down is an understatement. Camila Giorgi she is not, and most others find it difficult to maintain an attacking game when they’re undersized. Those weaknesses might’ve not been as prevalent when they were offset by the fearlessness — or reckless abandon, as you say — of her youth. However, grass is the surface that’s going to reward her aggressive instincts more than others, which might explain her relative success on it in recent years — even as she struggled elsewhere. Consecutive third round showings at Wimbledon in 2013 and 2014 are certainly an outlier, especially when you realize she’s won just one main draw match at the three other Grand Slams since 2009. DK: For all of her inconsistencies, Larcher de Brito still appears to enjoy being the underdog. Out-gutting Maria Sharapova in straight sets and out-gutting anyone (much less a Top 10 opponent in Ana Ivanovic) in a final set tiebreak are hardly easy asks, and she’s done both in just under two years — while admittedly little else. This week has to be her most impressive since 2009, winning four straight matches as a qualifier, and she has as good a chance as any to go one better against veteran Daniela Hantuchova. We could well be seeing her rebuild that infamous confidence, but with Larcher de Brito, disaster never seems too far behind. After all, she did lose to French wildcard Clothilde De Bernardi in Roland Garros qualifying just four weeks ago. VC: Whatever Larcher de Brito’s result in Birmingham, she’s done well to recoup some of the points that will be coming off her ranking in a few weeks’ time. It’s a tired refrain, but out of all the players on tour, her age is the one I find myself forgetting the most. She’s been on our radar for so long, and yet she’s still only 22. While I’m not saying she’ll become the world-beater Bollettieri felt she’d be, it still seems too early to proclaim her a lost cause. …At the very least, it seems we have a lady-in-waiting to Tsvetana Pironkova’s grass court specialist throne. 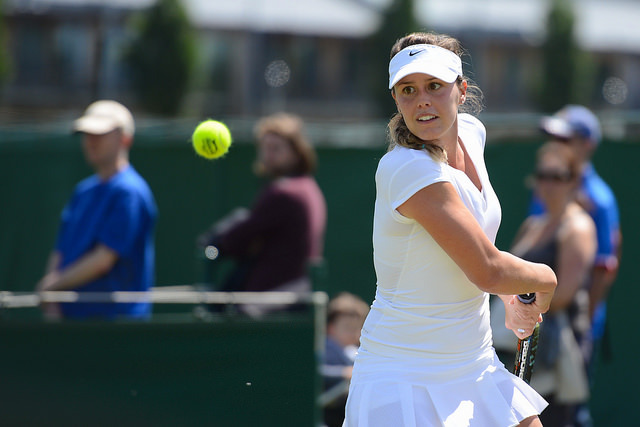 Michelle Larcher de Brito, Wimbledon semifinalist. You heard it here first. DK: The odds of her doing something at Wimbledon, something that will leave you awkwardly standing at the net — perhaps waiting for a handshake — seem at an all-time high. Whether that thing is good or bad remains to be seen, but when it comes to the Michelle Larcher de Brito, shock is sure to be on the menu. What’s next for the one-time teenaged prodigy? Sound off in the comments!